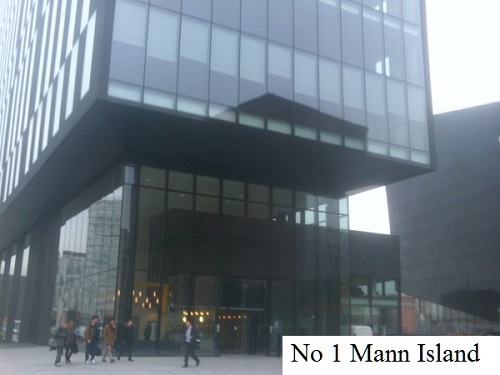 The Liverpool City Region Combined Authority met for the first time in the Authority Room on the first floor of 1 Mann Island (pictured above). The meeting started with appointment of the members of the Combined Authority. These nominations had been made by the Merseyside councils, Halton Council and the Local Enterprise Partnership. These appointments were agreed. The meeting then had to decide who would be the Chair and Vice-Chair of the Authority. Cllr Phil Davies was nominated and proposed as Chair, there were no other nominations and he was elected as Chair. Cllr Phil Davies invited nominations for Vice-Chair of the Combined Authority. Cllr Ron Round was nominated and seconded. There were no other nominations so Cllr Ron Round was elected as Vice-Chair. No declarations of interest were made. Cllr Phil Davies invited Angela Sanderson (Monitoring Officer Designate) to present item 4 (establishment of the Combined Authority. She said, “Thank you Chair, on the agenda this is at pages three to 141 and you’ll be pleased to know I don’t intend to go through it page by page. The report outlines the two main documents which deal with how the Combined Authority will operate in practice and from today the Combined Authority is a legal entity in its own right, with its own duties, its own powers, its own responsibilities and in order to ensure that it can meet its duties and exercise its powers in a manner consistent with good governance it’s worked with the other authorities and developed its constitution. This work has been carried out by legal and democratic services officers from the six local authorities and from Merseytravel. The constitution is included on the agenda from page 9 to page 105 is the outcome. It’s divided into eight parts and much of it will be familiar to members in the constitution of their own local authorities. We recognise the constitution has been developed quite quickly and that its utility can only be measured in the light of experience and it will be kept under review to ensure that it meets the needs of the Authority. The operating agreement has also been developed by those officers and partners and it sets out the basis that the Authority will run and in particular because the Merseyside Integrated Transport Authority no longer exists and the transport functions and policies have been transferred to the Combined Authority by order, the agreement deals with the establishment and membership of the Merseytravel board to deal with the Authority’s transport functions. The Authority will be asked to review these arrangements on the 1st April 2015. It also sets out several protocols which have been developed by other officers and intend to cover how the Authority covers regeneration functions that the Authority will need to cover. The operating agreement has been approved by the six local authorities and subject to agreement by this Authority steps will be taken to execute the document by all parties. section 6.1 of the report. The meeting then considered the following notice of motion proposed by Cllr Barrie Grunewald and seconded by Cllr Rob Polhill. “The Order to create the Combined Authority identified that the legal name of the organisation would be the Halton, Knowsley, Liverpool, Sefton, St Helens and Wirral Combined Authority. This wordy title has been imposed nationally by the Secretary of State for Communities and Local Government, showing his scant regard for the view of local areas. All constituent Councils have consistently stated that the Combined Authority should be known as the Liverpool City Region Combined Authority: this was set out in the Review of Strategic Governance in September 2013 and in Councils’ responses to the Government’s consultation in January 2014. In the debate to establish the Combined Authority in the House of Commons on 18 March 2014, Local Government Minister Brandon Lewis, under pressure from Knowsley MP George Howarth, stopped short of apologising for this imposition by stating that "The authorities can choose whatever name they want, work under that name, brand it and "logo" it." He went on to say "Under the powers that we have introduced, combined authorities can now choose the brand name that they want to use, whatever it may be, and use it strongly and effectively to represent themselves". This is a clear u-turn by Government and presents an opportunity for the Combined Authority to be clear on its name from day one by using the existing Liverpool City Region brand. Cllr Grunewald said, “Thank you very much Chair. In September 2013 across six councils in the City Region and the Local Enterprise Partnership representing over 1.5 million people agreed to submit a document to the government proposing the establishment of the Combined Authority proposing that it be called the Liverpool City Region Combined Authority. No other name was proposed and there was no disagreement between us, all agreed on Liverpool City Region was a attack brand. Despite that, the government went out to statutory consultation on the proposals calling it Greater Merseyside Combined Authority. In January 2014 once again and in response to the statutory consultation the elected representatives of over 1.5 million people requested the name of the Combined Authority should be called the Liverpool City Region Combined Authority. No other name was proposed by any other council, there’s no disagreement between us. Yet again, despite that the government have imposed an unworkable title of Halton, Knowsley, Liverpool, Sefton, St Helens and Wirral Combined Authority. In doing so the Secretary of State has demonstrated his contempt for the people of the City Region and their elected representatives. The mantra of localism has never appeared more ludicrous. Six councils in the City Region have a track record of working together effectively. This has been demonstrated most recently by the speed with which this organisation has achieved Combined Authority status, something which others elsewhere thought couldn’t be done in the timescales that we worked to. In working together we have always recognised the value of the attack brand Liverpool City Region. We’ve emphasised this time and time again. We’ve no intention of losing the instant recognition which this brand gives to us across the world but today is so much more about than a name, we need to deal with this now and move on to the vital work ahead. Robert Hough confirmed that the local enterprise partnership had unanimously endorsed the choice of Liverpool City Region and supported the motion. All seven members of the Combined Authority voted in favour of the motion. “Operating in an open and transparent way…” Haha. Ever the joker, Cllr Davies knows how to inject a bit of cruel, callous, savage, heartless, thoroughly sick humour into proceedings just to keep things ticking along doesn’t he? Oh I forgot to mention that the afternoon before the meeting was held, an officer (who made the decision) stated in respect of filming the meeting “that I am unable to accede to your request to film the proceedings on this occasion”. That has got to be the best April Fool gag ever. Its not,then God help us. doubt if it will have any effect on Tunnel Tolls.Just gives him a wider arena to be incompetent and mismanage things,that man would have difficulty running a bath! In his Liverpool Echo interview that I saw on Wirral Leaks he had the audacity to talk of “helping business to thrive and start up”. When will he reveal the Grant Thornton and DCLG Reports on Big, ISUS and Working Neighbourhoods? I would think his voters do not know about those dirty little secrets I had to enlighten the lady were I live who is “gagging” to be my local Labor person. I suggest his tenure will not last as long as he has had that Grant Thornton Report ferreted away and/or parked with the police. Ps Keep up the excellent work.